Cacciatore means “hunter” in Italian. Preparing food hunter-style basically means stick it in a pot, cover with fresh veggies and herbs and let it cook. Which is exactly what you do with this dish. 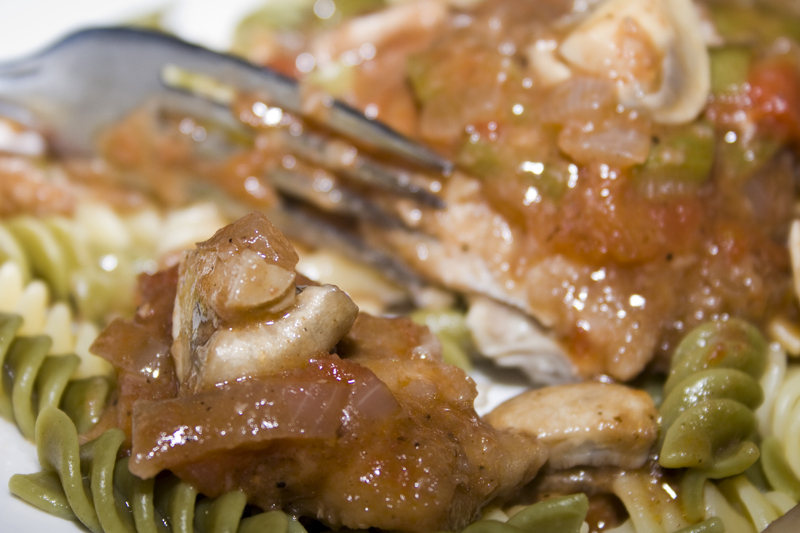 It’s hearty and delicious, full of fork tender chicken and a fantastic vegetable sauce. A perfect pairing with pasta and crusty bread. I generally find that making Italian food (and Mexican food too) destroys my kitchen. Not so with this fabulous chicken dish. It gets cooked in one pan, and the majority of the cook time it’s just simmering itself into deliciousness. Score! 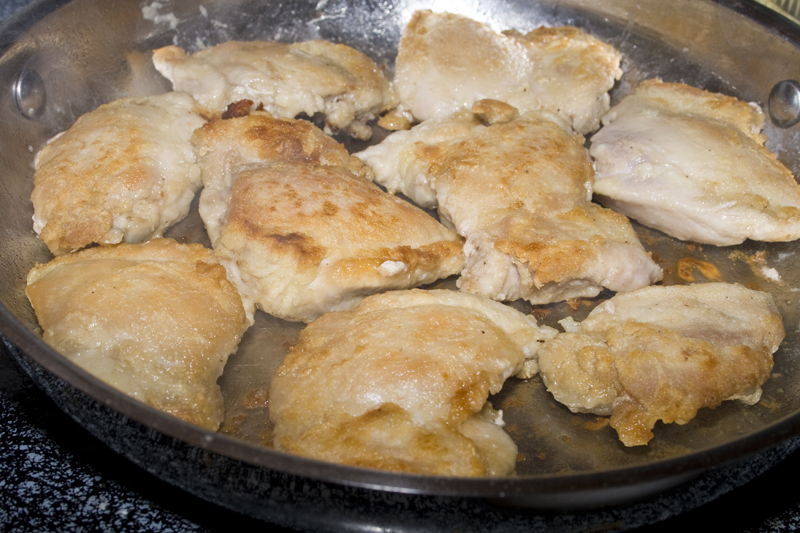 Start with some boneless skinless chicken thighs, dredge in flour (with salt and pepper) and fry in a little olive oil until browned on both sides. 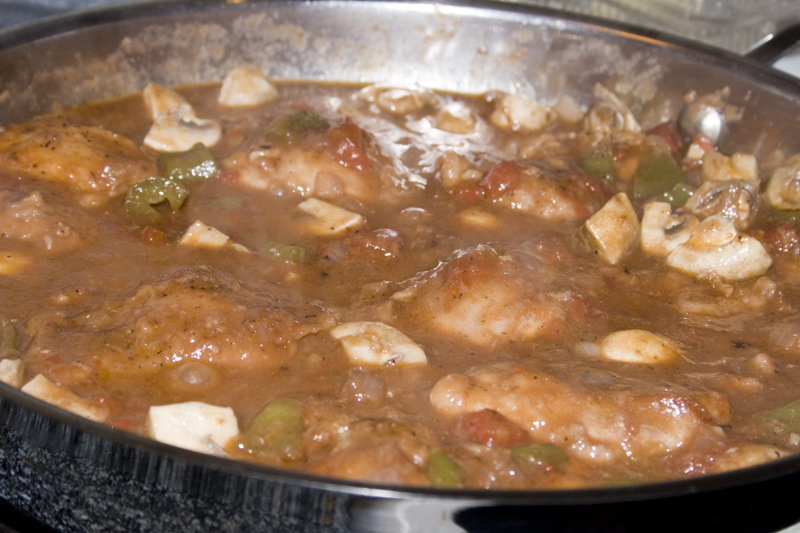 Remove chicken to a plate, then dump some chopped onions, garlic and green bell pepper into the same pan. Allow to cook slightly. Don’t worry about all those “ugly” brownish bits that have stuck to the pan. We’ll take care of that later. Then the best part. Wine. Cultures that cook with alcohol totally know where it’s at. Something interesting about cacciatore. The traditional wine for this dish is different based on what area of Italy your recipe is from. You can use white or red. I prefer a nice burgundy wine. 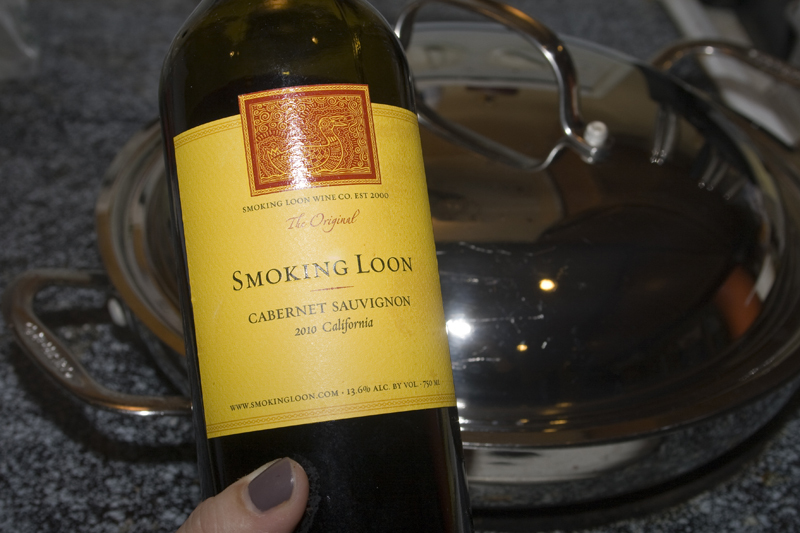 I just think it gives the sauce a deeper flavor, but feel free to use your favorite chardonnay if you’d like. 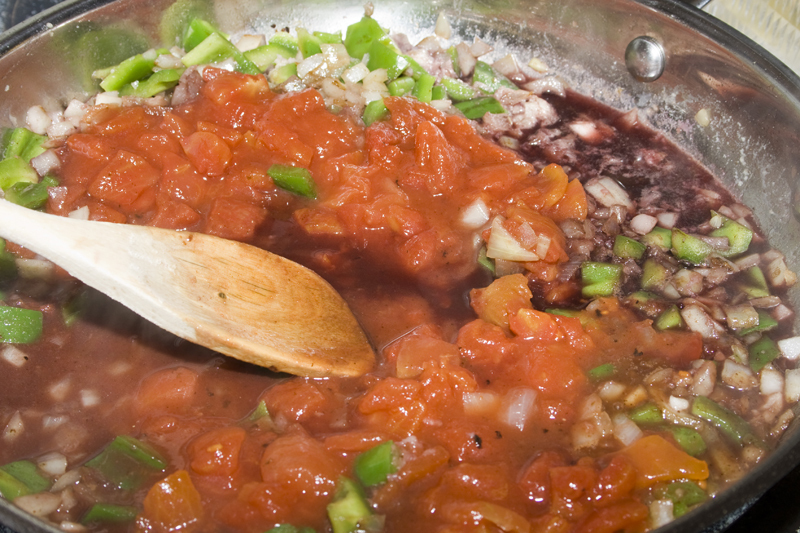 So we add the wine and some tomatoes, use the bubbling liquid to scrape up any little brown bits that have stuck to the bottom of your pan. I love this part. I know that every little lovely crusty morsel is packed full of flavor. Mmmmm. 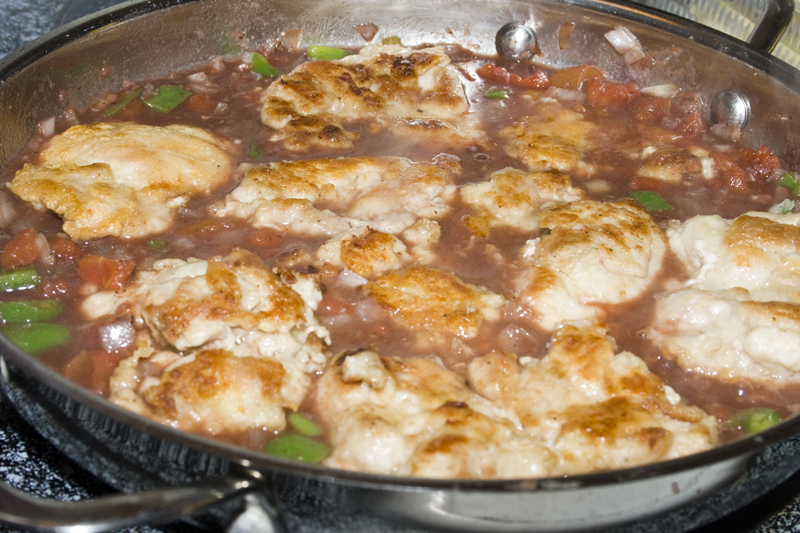 Add the chicken back to your pan, cover and simmer for 20 minutes. 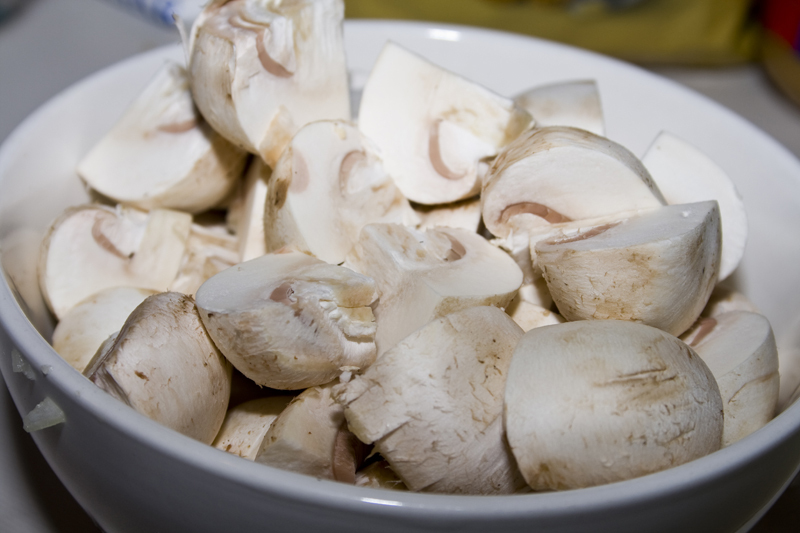 Add some chopped up mushrooms and simmer about 10 more minutes. 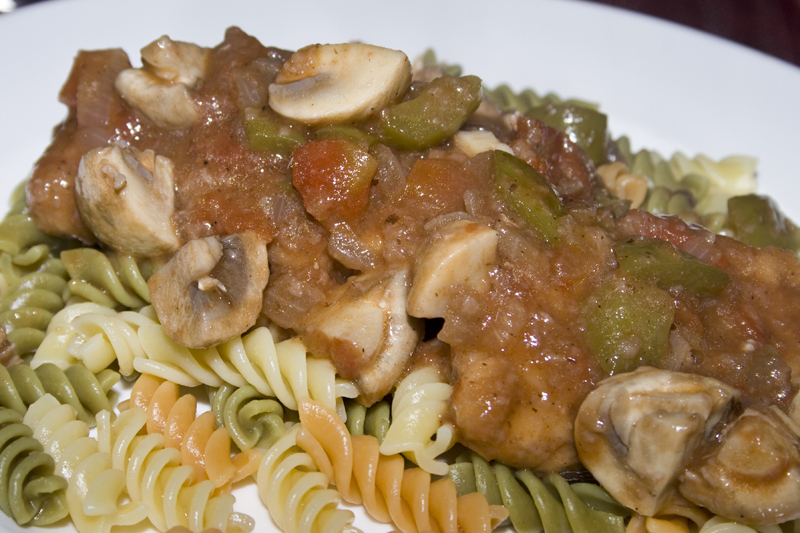 The sauce thickens up, the vegetables break down and the chicken just becomes perfection. So tender, juicy and delicious. Piled high with full-bodied flavor. No knife needed. That chicken is like soft butter when you put your fork thru it. 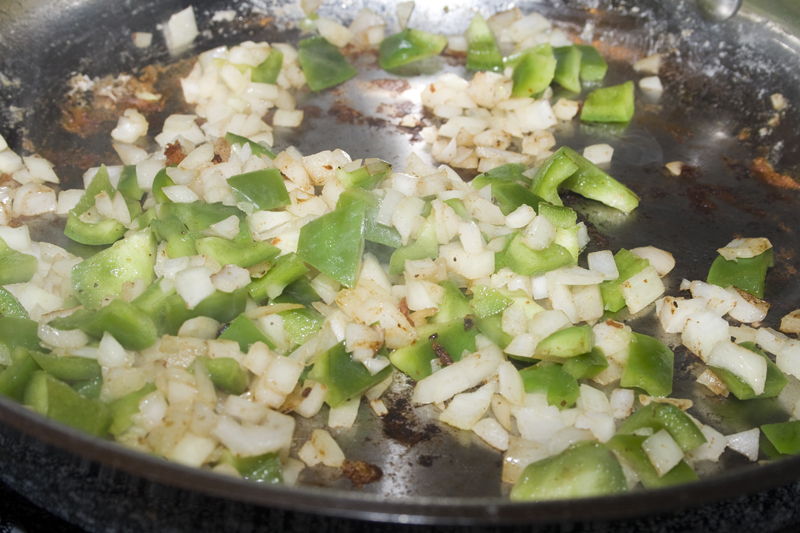 Add the onion, garlic and bell pepper to the skillet and saute until the onion is slightly browned. Return the chicken to the skillet and add the tomatoes, oregano and wine. Cover and simmer for 20 minutes over medium low heat. Add the mushrooms and salt and pepper to taste. Simmer for 10 more minutes. Serve over pasta.